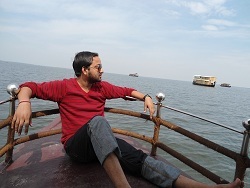 Allow me to introduce Mr. Sarang Mahajan, an author by passion. 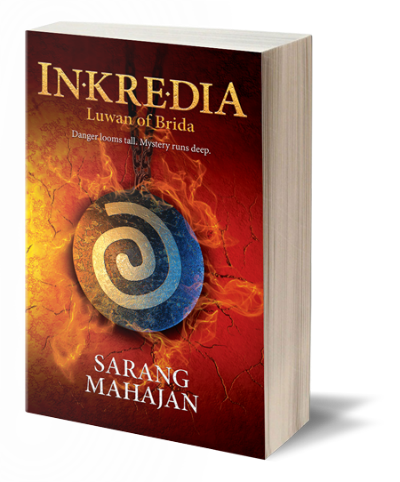 Recently we got a chance to read his debut book INKREDIA which is now available as “INKREDIA: Luwan of Brida” is a fantasy fiction. We are impressed with the book, especially the way the fiction is elaborated and thought it would be interesting to know more about him. What could have been better than an Author Interview?! So we’ve approached him, and fortunately, the things worked out positively :). I am glad that from our team I got a chance to have this Q/A session with him. We are glad to have a conversation with you. As your book is getting both commercial success and critical acclaim gradually, I can see the flow is started, and obviously, you are enjoying it. Can you share your feelings? First of all, thank you very much for an opportunity to share my views here. To answer the question… yes, I am satisfied to see that the book is finally making its way into the readers’ hands. It makes me happy when they come back with the kind of feedback that we have received so far. 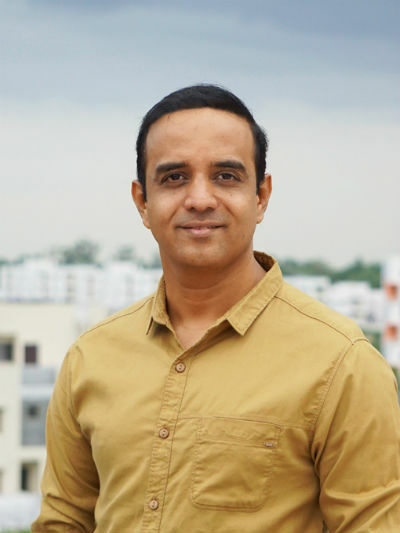 Over the last few years, fantasy in India has shaped up into mythological fiction and it did bother me a bit that INKREDIA does not fall into that genre at all. It’s an original fictional universe that I have built from the scratch. The book belongs to the fantasy genre as it’s perceived globally. But I was wrong to worry. The response has been phenomenal. Most of the Indian readers that we have managed to reach out to have absolutely loved the book and the freshness it offers. I do feel happy, yes, but not really accomplished yet. There is a long way to go. In fact, I now feel the pressure of bringing out the second book in time as I don’t want to keep the readers waiting for too long. Yes, you are absolutely right. It’s an absolute delight if you are able to follow your passion as a profession. Especially because it’s not an easy thing to do for most of us. There are so many hurdles in the way such as a social pressure, finances, a struggle to acquire the necessary skills, the dearth of opportunities and, most importantly in India, expectations of the family. It takes an incredible effort in our country even to make it to the point from where the real race starts, where you have managed to make your work public and entered the competitive arena called the market, the only place that can turn your passion into a profession. The real challenges lie beyond this point. So, yes. It’s an absolutely wonderful feeling that I have managed to put myself on the path toward realizing your dreams. I have tried a lot of things. I used to be a programmer but switched to web design due to my creative inclination. Started an IT business. A business, because a job would not have given me the freedom to follow my real passion, which is writing. Over the last few years, I have mostly been writing, mainly TV shows. I have done a few shows for Star and Colors. But my passion is telling stories and at the moment writing novels is helping me realize it in the best possible way. I would love to do that for the rest of my life. Storytelling. I love creating elaborate stories that have entertaining characters and a fascinating world that imparts values, explores human nature and relationships along with a lot of fun and excitement. I don’t think of myself as a literary expert. If I could create a TV show the way I wanted, or a film, I would do that as well. Whichever medium helps me tell the stories that I have will work for me. Presently, writing books is the best way I can do that. There’s a struggle gathering the right skills in any profession and I wasn’t spared. It’s still going on. But I don’t think it felt like a challenge at any point. It’s something that you can overcome through a sincere and constant effort. The biggest challenge I faced was after I decided that I wanted to write a book. I decided to do it as a career and not as a hobby or a side job. Hence, it demanded a lot of sacrifices. I had multiple choices for a safer career, but I consciously skipped those and decided to sail into the unknown waters, which invited family and social pressure and also a little self-doubt. Now that I look back, going through this stage was quite challenging. Also, later when I was writing the book and the process was taking its sweet time, not going back on my decision was also a challenge. I am glad I stuck it out. Writing a fantasy fiction where you are creating a new world, new species, new vocabulary, is quite a challenging job. Can you share your journey of creating the same? My journey of building the world of Inkredia has been the most rewarding, more rewarding than anything else. It’s what I love to do. In fact, when I decided to write a fantasy book, I instantly decided that I will not use the same old dragons, elves and dwarves, but rather I would create new fantasy creatures and humanoids. Along with that, I also decided to create a new universe. Sometimes it feels like a lot of work because you have to come up with everything, a currency, festivals, a culture and so on, but it completely satisfies my creative urges. The only challenge that I face in doing all of this is separating myself from the real world and day-to-day stuff. Once I have managed to do that, things simply flow. Is there a specific logic/reason behind the names you’d given to places/people/species? Can you elaborate more? I try to find names that resonate with the characters of the people or species and are easy to pronounce as well as carry the required weight. Also, there’s a naming system that I have developed which the readers will be better acquainted with in the second book. For instance, cities and characters from a certain region will follow a specific nomenclature, because that’s how it is in real world. Sometimes, I try to isolate the characteristic that defines a certain character and try to find words for the same in other languages. Then I build my name based on whichever word I come across that I like. That way, there’s a certain character to that name as it’s based on something real, something that has adopted its form naturally over several centuries. Sometimes I don’t engage in research and simply come up with words that seem to bring in the necessary feel and character. Can you tell which scene(s)/ part(s) of the book you enjoyed writing the most/like the most in this book? I try to enter the mind of the character from whose point of view the scene is happening. Once I am there, I go through all their emotional or visual experiences. This helps me enjoy a high octane chase sequence as much as an emotional exchange between a brother and a sister. So, I enjoy everything that I write at that moment. Although, action or mystery solving sequences do offer a lot of enjoyment to me as a writer. I always want to write. But yes, sometimes I come across a scene that I am in no state of mind to deal with at that time, so I don’t force myself to write. I usually set myself a deadline in terms of a date and try to get as many writing hours out of each day as possible. Sometimes, I go for days without writing a word, sometimes I hit a really fruitful week. The book cover plays an important role in book selling, were you involved in the book cover designing process? How much? Also what made you update the name of the book, since it’s previous release? I thought that Luwan’s pendant is a meaningful object to make a cover out of as it’s a close part of his personality and the first book is about him. I also felt it would make a catchy theme visually. But the credit goes to Sudhir Kumbhar who really made it work through his skill and talent. He designed the pendant and the bow and arrow on the back page in 3D, from the scratch. And then he created that mysterious feel with the magical plumes while achieving a color combination that would grab the attention in a bookstore. I worked closely with him for this and he kept going on relentlessly until I was satisfied. In fact, even after I had Okayed a design, he came up with one more that was even better and made the final cut. He also designed the wonderful map that has been loved by everyone so far. The name of the book is still the same. It’s just that in the first book, “Inkredia” appeared on the inner flap that could be opened as a cover extension. This time, we decided to bring it on top. Any book, no matter whether a fantasy or a regular fiction, connects with the audiences only and only because of the human element in it. The book has a lot of action, intense sequences, magical elements, but there’s also a strong undercurrent of human values. I think the human relationships form the crux of this story, be it the relationship between Luwan and his sister, Meg, or their relationship with Narjo or the bond that they form with Kiliarn. Even the main villains, the Ghork Riders are human. Since it’s a fantasy, there are no scenes as such that have been inspired by real life incidents, but I have tried to keep the characters themselves as realistic as possible. Every book affects its author in some way. How do you think writing INKREDIA affected you. The only effect I can think of is how it made me into a better writer than I was before I started working on it. It helped me polish multiple facets of my skill. Why should one read, INKREDIA, according to you? One should read this book if they love fantasy books, fantasy elements such as different races and creatures, fast paced action-adventures, exploring new fantasy universes and if they like books with a strong human element. Seems you are a mythology lover. Can you tell us something about your favorite mythology tales? Actually, I am not at all into mythology. I loved Ramayana as a child and still believe it’s one of the finest stories ever made, but I have never been into mythology. My mother told me Mahabharat, but, at that age, I only cared about the heroic stories of Arjun and Bhim as I found them more fascinating than the rest. Other than that, I couldn’t really I get into Mahabharat, probably because I never got to reading it as an adult. I came across Greek and Egyptian mythological figures through some fantasy reading and liked the gods such as Zeus and Poseidon, or Ra, but that’s about it. Your love for the nature is visible in the book. What in your opinion we should do to preserve it? Yes. I do love forests, rivers, a day spent among hills. There are some basic lessons which need to be delivered at a young age and then repeated again and again… the first one is that the nature created us and now we are eating it up in ways we don’t even realize. We need to tell our children that we, the humans, are the most selfish and ungrateful race among the billion other races on the planet that include plants, insects, animals birds and sea creatures. For instance, we purchase a plot from the government and build a house and get the feel of ownership, but we do not even realize that we are also taking it up from the nature and giving absolutely nothing back in return. Although we cut down trees and destroy hundreds of homes of birds and insects on a single tree to build the place. This is one of the million ways in which we act selfishly and ungratefully every day. The first step toward preserving nature would be to create a strong sense among children about this so that every ungrateful act nags our conscience a little. Only then will we be clear to take further steps for preservation. Unless the entire population, or at least a significant portion of it, engages in this act, we are not going anywhere. My favorite books are Lord of the Rings and the Wheel of Time Series by Robert JordanHarry Potter Series, of course. Other than fantasy, I loved The Pillars of the Earth by Ken Follet. I love the writing style of Roald Dahl. None. Haha. I can’t read when I am writing, which means I don’t read as much as I should. It’s something I want to fix. Photography and traveling, though I can’t spend much time doing any of the two these days. I think e-books are fantastic in many ways. Yes, they will never make you feel the way a beautifully printed book does – the smell of paper and the way it excites you to dive right into the story and have a great time. But we ran out of enough trees long time ago and we have no option but to go paperless wherever possible. Practically, e-books offer an ease of reading that might actually help impede the drastically falling readership. It could be one way to combat with other easier forms of entertainment. I do love traditional, printed books and still collect the good ones, but I have switched to Kindle since a few years due to the convenience it offers. You can carry all your books while traveling without being worried about the baggage weight. I also feel Kindle is comparatively more comfortable to hold while reading. Not really, not the traditional ones, except stories from Mahabharat that my mother told us. I read Panchatantra and other such tales at my own, and they did impart some useful practical and moral advices. I have always loved fantasy and adventure stories and it was my maternal grandfather who satiated that hunger. He would tell us stories during summer vacations, mostly the western classics such as Treasure Island, A Tale of Two Cities, Great Expectations and so on. Later I read the adventures such as Three Musketeers, Invisible Man, Twenty Thousand Leagues under the Sea and many more. I am truly grateful to my Grandfather for introducing me to this fascinating world. It was one of the best times I had as a child, which later shaped me into a writer. I know a few families where it still happens, but it does seem like a diminishing thing. There are so many options for entertainment now. Tell me a kid that would want to sit and listen to a story rather than playing a video game or watching cartoons on a YouTube channel? Also, show me a parent that would spend time telling a story to their kid rather than going for an easy escape by putting a mobile phone in their hands and showing them how to browse YouTube? I am yet to make a good use of social media myself so I can’t say anything with authority on this matter, but I think first we need to control spam and fabricated news, because it’s hurting the credibility of social media in a huge way. Although, yes, it’s possible to spread such awareness and it does happen to a certain extent already. I think it was seven or eight years ago at a book signing event. I just went through it without much thought I think. It did feel a bit awkward doing it though. Haha. Here are the links to my Social Media Pages.